This volume is the earliest detailed report on Chinese and Japanese medicine to be written by a European. Meaning ‘to prick with a needle’, the word acupuncture was coined by Willem ten Rhyne, a Dutch physician who was responsible for bringing the technique to Europe. The knowledge of acupuncture in Europe was generally derived from reports by travelling doctors in Japan on the one hand, and treatises by Jesuit missionaries in China on the other. These writers had different training, knowledge and interests, and they emphasised different aspects of Chinese medicine. After completing his medical studies at Leiden, ten Rhyne travelled from Holland to Deshima, a small island off the coast of Japan in 1673. There he served as resident physician at the trading station of the Dutch East India Company in Nagasaki Bay. At the time, this was the only foreign trading post permitted in Japan, and the Dutch had exclusive rights of trade. He stayed there for 2 years. During his time in Japan, ten Rhyne studied Japanese culture, medicine and botany. Despite strict controls on foreign movements, he was able to witness the practice of acupuncture and to see first-hand the therapeutic effects felt by the patient. In 1683, the Royal Society published the results of his observations. In Dissertatio de Arthritide; Mantissa Schematica; De Acupunctura; et Orationes Tres, ten Rhyne states that the principles of Japanese and Chinese medicine are too difficult to explain, so rather than focusing on the theory, he concentrates on the practice itself, paying particular attention to pain relief, treatment of gout and arthritis. Ten Rhyne believed that the build-up of wind or energy in the body caused the pain, and by puncturing the skin, the wind would be released, curing the patient. The volume contained 4 plates, showing for the first time in Western literature the acupoints and acutracts used in acupuncture, although he misidentifies the latter as blood vessels. Alongside these plans, he gives detailed information on the technique of needling, whether through gentle rotation or forcing with a hammer, and included the different types of needle used with the materials used to make them. He also discussed the practice of moxibustion, the burning of mugwort on or near the skin during the process of acupuncture. The book makes little attempt to understand the theoretical basis behind Chinese thought, or the alternative herbal medicines also used in Asia. However, it is the principles of traditional Chinese medicine which form an important part of the practice of acupuncture and, by leaving these out, ten Rhyne fails to truly explain the practice. 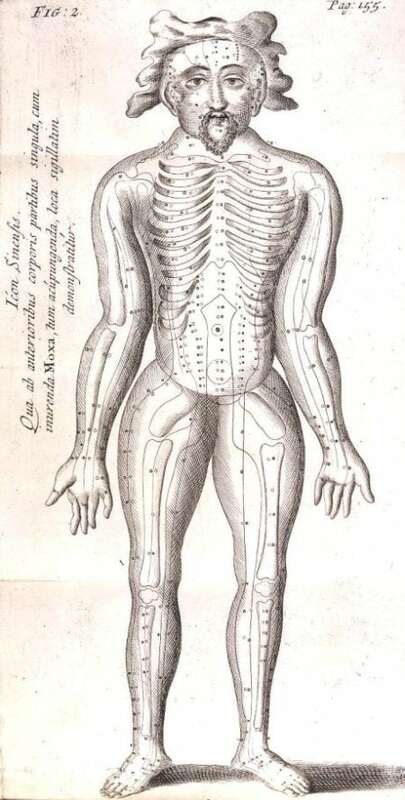 Over the next several centuries, acupuncture went repeatedly in and out of fashion in Europe as physicians struggled to align its principles with their own understanding of the human body.